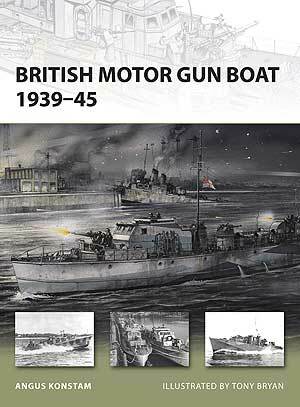 British Motor Gun Boats 1939-45. Media and Contents: A5 sized with a soft cover, 48 pages of text, 41 good clear black and white photos, 8 full colour side profiles, one sectioned illustration and two action artworks. Advantages: Covers all aspects of the subject from their development to performance, armament and actions with many clear photos and excellent artwork. Conclusion: Although there are some older large-scale models of these or similar boats, White Ensign Models does some extremely nice resin kits that this book would be very helpful to. The more I see of Osprey’s New Vanguard series of books the more I like them, especially when it's a subject I'm interested in but don't know much about. Before the war started, the Royal Navy had begun operating fast Motor Torpedo Boats, (MTBs), but when they came up against the German S-boats, the MTBs were found lacking in armaments to the point that they needed protection of some kind. Initially, the British built ship based protectors but these weren't fast enough to accompany the MTBs on patrol. They them began to use the same hulls as the MTBs, removing the torpedo tubes and adding extra guns, calling them MGBs, (Motor Gun Boats). Where the MTBs were the fast bombers of the sea, racing to deliver their weapons to the enemy, the MGBs were the Spitfires or Mustangs, fighter escorts, protecting the bombers from enemy fighters and attaching the enemy bombers. Later in the war, some MGBs, especially Fairmile “Ds”, were fitted with torpedo tubes making the classification between the two some what blurred. I always believed that the Fairmile were the poor cousins of the speedy planing boats but I now know that is not quite the way it was. These planing hulled boats by BPB, (British Power Boats), and later the US Elco, (Electric Boat Company), and Higgins, (Higgins Boat Company), boats could do 40 knots plus and were designed to skim over the surface of the water rather than slice through it like the Fairmiles and indeed the German S-boats, known by the British as the E-boats for Enemy Boats. With a design philosophy from all three manufacturers based on power boat racing making then very fast, the slightest swell or even just some chop would cause them to slow down for fear of damaging the almost flat bottomed hulls, where-as, the Fairmiles and S-boats could maintain their top speed until much rougher conditions because they tended to cut through the waves affording them a much higher speed than the planers who had to crawl along giving their crews a most uncomfortable ride in such conditions. The Book begins with a short introduction and then heads straight into development starting with the British Power Boat MGBs, Lend-lease MGBs, Early Fairmile M/Ls, Fairmile C MGBs, Denny Steam Gun Boats (SGBs) and finaly the powerful Fairmile D MGBs. Construction and Weaponry is next describing the build process, propulsion and armaments of each type. MGBs in Action is a short piece covering only two actions but gives a good idea just what these Coastal Forces boats were doing. Last of all is Vessel Listings with ML and MGB Specifications, losses and Pennant number listings. Throughout these chapters are spread a host of very good B&W period photos but one of the best aspects is the art-work by Tony Bryan. The eight side profiles start with two BPB MGBs, a 70ft above and a 71ft below. Two early Faimiles follow, an “A” M/L above and the more numerous and successful “B” M/L below. The next pair are a Fairmile “C”, a forerunner and stopgap for the bigger and more successful “D” and a Denny Steam Gun Boat, the giant of Coastal forces, nearly twice the size of the original BPB boats but still capable of 35 knots, quite respectable for its size. The last two are Fairmile “D” MGB variants. Known as Dog Boats, they were fast and well armed and quite capable of taking on a German S-boat, having a similar performance. The top one is a pure MGB while the lower is fitted with the same gun fit plus a pair of tubes making it a dual-purpose MGB/MTB. Some of these were fitted with as many as four tubes. We then have a cut-away of a Fairmile “D” showing the various below decks compartments, crews quarters, engine rooms, fuel tanks, etc. Finally, two action paintings, a night-time scene from the St Nazaire Raid showing HMS Campbelltown in the background and another night-time scene of MGB-655 during a convoy battle near Giglio, Italy in January 1944. The text of this book is so readable and the photos and artwork complement the text so well that I have no hesitation at all in recommending this volume to anyone interested.